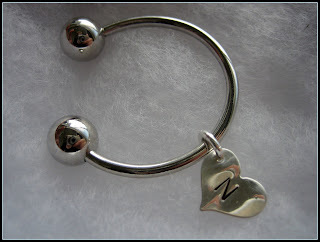 Kelly Couture - her personal line of hand stamped sterling silver jewelry. We recently decided to do a little trading and look at the lovelies she sent! My photos are horrible, but make sure to check out her site for yourself. Wouldn't these be amazing birthday or bridesmaids gifts? Thank you Kelly! I can't wait to make all of my friends jealous. you have managed some fantastic trades! glad to hear you liked your stuff. and the earrings you sent were beautiful! i don't know if i'll be able to give one pair up for the giveaway! I agree. Keep them both. I can always send another pair for a giveaway. Hi Natalie! It's Sarah from Sally's Clippies. These necklaces are darling. 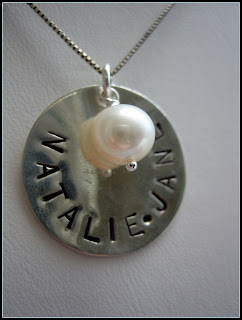 I am going to see if she can make me one with three pendants on it for all three of my kids' names. I might be interested in doing a trade with you. Your jewelry is darling! I will start shopping your stuff and let you know what I want. ;) Email me with what clippies you are interested in.